Some Decorative Items Give More Bang for the Buck! Welcome friends to Ten on the 10th for the beautiful month of March! Our goal, as a group, this month is to share decorating items and ideas that cost less than $10. When we arrived at this idea, I began looking around the house and thinking of how much I have paid for things over the years and decided to put a little twist on this post. I love to read fashion blogs and have noticed that those ladies often refer to cost per wear of a clothing article. What if we consider days, seasons, and years of enjoyment in reference to the cost of decorating items around our house? Why not? The cloche in this coffee table vignette has been with me for probably 15 years. I bought it before they became extremely popular and available just anywhere so it was not inexpensive. However, I love it and it's always out somewhere in the house. What would the cost be over time? Absolutely minimal! The little plant is from Ikea and was probably about $5.00. The white platter came from HomeGoods years ago so you know it was under $10. It moves all around the house and has served food before. That's money well spent. This kitchen counter vignette begins with a silver tray that was passed to me by my sweet aunt. The cost to me was $0 yet the tray is a priceless item to me. I love the sparkle that it adds to the counter and it corrals a few things that I need or want close by. The butter dish was $5 or less from HomeGoods. It's a seasonal decorating item for me that you've seen here before. The paper towel holder is old! That was part of the Tracy Porter Collection for Target years ago. Remember that? I have considered replacing it but I love it still so why would I? I'm sure I bought it on sale and for less than $20. Years ago when we lived in Oklahoma, we went to the farmer's market one Saturday. There was a lady who was living the dream! She grew flowers and sold them in bunches at the market. When you purchased flowers they came in a recycled container you could pick from her collection. 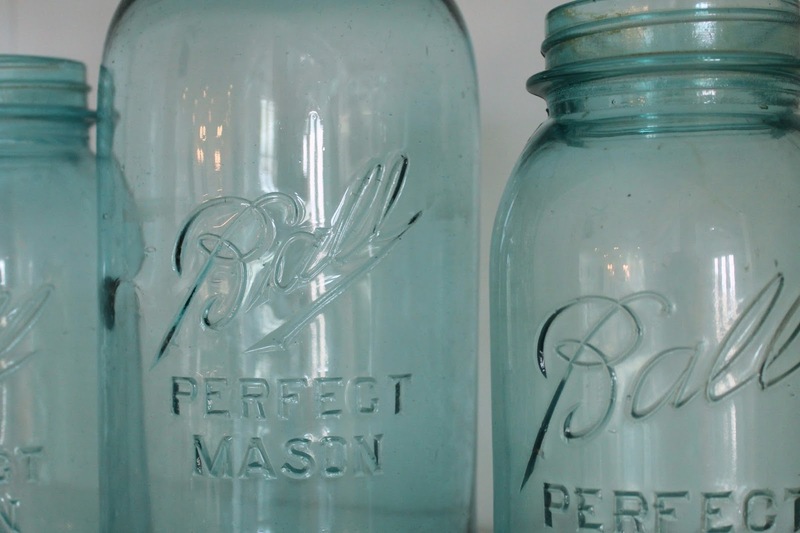 I chose an old blue Ball jar. It was free with the flowers which were less than $10. That first jar cinched my love of this beautiful aqua color and since then I've collected a few more but all were less than $8 each. I'd love to collect more of these jars but the price will have to be reasonable for me to purchase them. Let's consider one more vignette... in the year 2000 we built our second home. I had so much fun collecting new things for that house! My girlfriend and I went to Tuesday Morning and ran across these terrariums (is that what they are called?). I seem to remember this was around $20 and at the time that was a splurge but now I've had it 18 years! Man how time flies!! What's the cost per days, seasons, or years? Practically free! I hope you were able to follow my convoluted thinking today. Mainly I just want to say that some things are worth a splurge and some things aren't. It's really just a matter of how much you love an item and how long you will enjoy it. I would love for you to tell me in the comments if there's something super cheap that you've loved for years. Is there something expensive that was worth every dime? 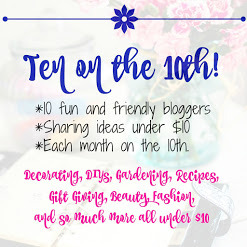 Want to see past Ten on the 10th posts? Click HERE. Nothing is popping in my head on the super cheap, but I love your thinking here. If you really love it and it stays around for a very long time it is worth it. I definitely think long and hard before I buy something new these days. My favorite expensive item was something I purchased with my graduation money from high school. I had babysat for a couple across the street since early 8th grade. I was simply in love with there home. The lady wasn't the typical neighborhood lady. She had obviously come from a wealthy family and her home was not trendy. It was decorated with beautiful antique pieces, but yet so fresh. I was taken away with her style. It is where I first saw blue and white ginger jars. I purchased a set as I graduated from high school. They sat wrapped up in my closet at home until I had my first home. They are still one of my absolute favorite purchases ever. What a beautiful collection of things that you love and have had for years. I'm with you, if you love it you should keep it no matter what the current trend is! Plus, I think you have chosen well over the years as all of you pieces look like you bought them yesterday. It would be hard to chose just one favorite out of you collection! Thanks for sharing. The story of how acquired your first blue jar is so fun. All your vignettes are so pretty and I love that they have sentimental connections. That is so much better than running to a chain store to buy the latest trendy thing. I am a big believer in splurging for comfortable chairs, couches and beds. I like your way of thinking - anything I splurged on probably cost less than a penny a day - - I am going to run that by my husband!!! You have inspired me to pull out an old silver tray that is hiding under the bed! Stacey - I am with you on this one! My entire home is "curated" with frugality in mind - the look for less for sure....I am happy at my fav thrift stores and consignment stores, and of course Home Goods and Tuesday Morning being two big-time favorites. Enjoyed this post. Glad to have a moment with my coffee to say so. Hugs. Oh, friend, I had a beautiful terrarium that I gave to a family member, and I have been kicking myself ever since. I love all these beautiful vignettes. You are so spot on with your advice to think carefully about the items you purchase to use in your home. I love that Farmer's Market story! How neat! I've had a tray in my bathroom that was only $5. It was part of the BHG collection at Walmart and I've had it for years. Love seeing pics of your pretty house. That butter dish is so sweet too! I think this is a great perspective. I think splurging on items in your home that are used daily is key...good furniture, rugs, dishes, towels, sheets. And I also believe a few key pieces in decor are worth splurging on. If an item can do double duty and move from room to room, I consider it worth investing in. I have some of those same items. Adorable. The Ball jars look fabulous in your kitchen. What a fun post and makes me so grateful for my inexpensive finds and my pricey pieces also. Smart girl to try to buy with the big picture in mind. I made a lot of 'cheap' purchases years ago that I didn't love or need once I owned them. The best thing I ever splurged on was a Bombe chest that I have had for 20 years and two white tufted back side chairs (that all the kids try to get away from me)...lol I still love all of those pieces as much today as I did the day I bought the. Definitely one of the benefits in dealing with vintage and antique items is being able to score the types of treasures you describe here. I love collecting the old aquas, greens and yellows from times past, and the silver trays like yours with the feet are especially fetching. 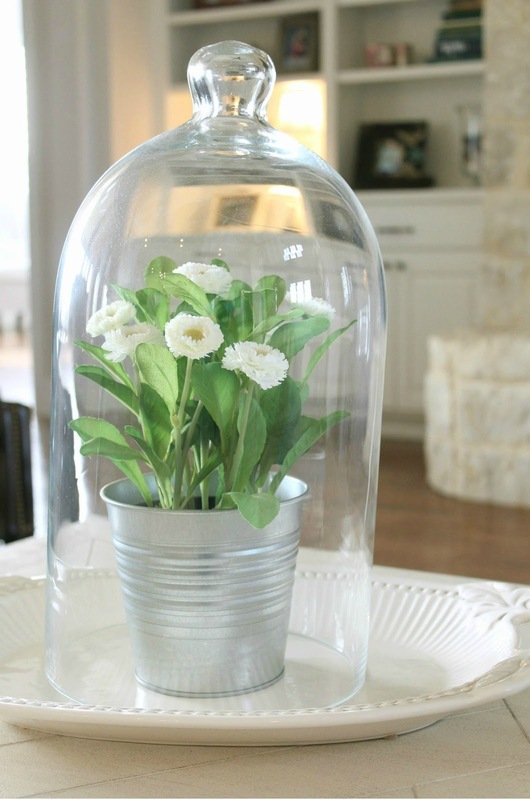 So are the old, glass cloches. They're still not easily found (the older, heavy ones). You have some great items, Stacey, and I love that you've used them many years. That's a sure sign of a treasure. Stacey, I have enjoyed reading everyone's comments on your post! Loved your story about how you acquired your first blue Ball jar, too. Have I ever mentioned to you that I have a brother and 2 nieces that live in OK? They live near Ada and Norman. My stepson lives in San Antonio. Hope to get out that way to visit everyone some day. 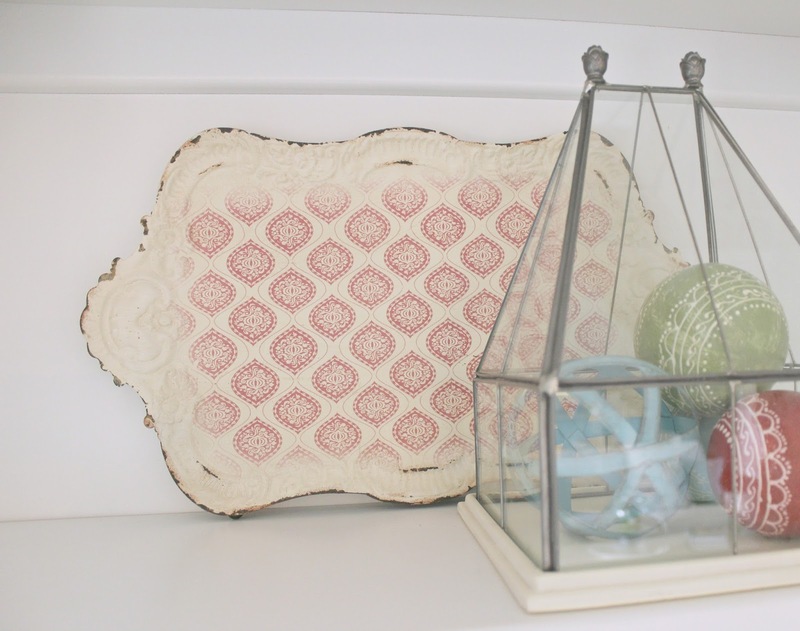 Just pretty vignettes and of course you know how sentimental I am so the story behind your collections is wonderful! I am a big believer in buy what you love...even if it's a tiny bit more, because like you said, you will have it forever. I have spend $5 here and $10 there on whimsy purchases because something was cheap and then tossed them because they were only $5...what a total waste. It's like buying a really good fitting pair of jeans, they may be a little pricey, but they will feel good and fit well for years!! And you can't put a price on that! I love your convoluted thinking! And it's a good way to look at the things I have in my decorating stash -- many of them are probably down to pennies a use or at least dollars -- and not a lot! Beautiful vignettes and they looks so full of spring. I especially love the stories, like the silver tray. You are right. Priceless. Stacey you make a very good point in looking at things over time. I was just thinking about duvet covers and how we keep them for many years so they are worth investing in. As are all of your pretty decorating items. They are all timeless and can be used for many years in different settings. Money well spent indeed! Stacey, I have some things I absolutely love that I paid very little for and I have some things that I splurged on and I still love. A blue and white Italian made pasta jar that came from Horchow and was quite expensive has sat on my island for 14 years and I still enjoy seeing it! Thanks for s great post! Hey Stacey! Love it all but was super excited to see the first one! I just bought 5 of those flowers/pots from Ikea and can't wait to set them out! Can't wait to see what else you share with us! Yes, I completely follow your thought process. Trying to think of the things I splurged on or got cheaply that have stood the test of time. I know I have those items. Ha, I'll have to think about it. I like thinking of things in the long term. Great idea! Most of the stuff I love in my decor is not expensive but just makes me smile to have them. I especially love my family heirlooms passed down. Such good memories attached. Have a great new week. Great thinking Stacey! Many of the things that I love most I have had for years. I am a bargain shopper, but every now and then I splurge when I love something. I'm the same way, some thingsI will splurge on, others not. Oh how I love blue Ball canning jars, especially with white hydrangeas. Have a beautiful day! I love all your vignettes with items you love and it is interesting to look around your house and see those things. Your story about the aqua Bell jar is a sweet story. Your aqua touches around your home are lovely. I have considered a cost per wearing in clothes many times but I haven't thought of it in terms of accessories. I enjoyed hearing your thoughts on that in your post. I love the things you decorate your home with. I always get lots of good ideas. I have thrift shops that are super cheap so I have to be careful. I have been known to donate things right back when they don't work. I did that last week. I don't mind doing that and the thrift store is for a good cause. Enjoy your week! Hugs! Great post Stacey! I think some of the staying power these items enjoy comes from being able to adapt and use them in different ways. Different things on the tray, or in the terrarium makes it fresh and new. 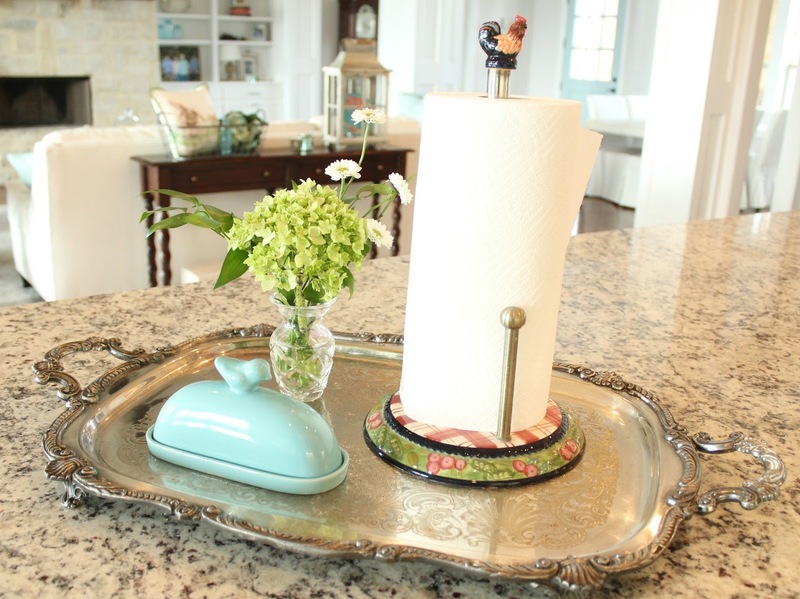 I love the paper towel holder, I remember that collection! I had a colander from that collection that I used for years in that very same pattern! Just now found this post. I totally agree. I have so many things that have stayed up to date through the years, and some have been in the closet sometimes for a while until a new way appears to style it. For example, a bird cage from JoAnn's back when they were still Cloth World. This year it gets a new vintage-style paint job, succulent garden, and a place on my dining table. YESSS! to old things! I love all of your cute little vignettes,the butter dish in particular. While I am pretty much at capacity in this house, I still enjoy shopping, and buying a thing or two. But these days, I don’t buy anything, unless I can immediately think of three uses (or more) for it. This was a fun post and I enjoyed it. I love how the blue jar is perfect for the colors in your new decor! I had two of those but they have made their way to Austin now ;) Funny how you and I both acquired those when our homes were mostly red, gold and green! I love this blog so much because that's how I feel exactly. Years and years ago, I saved to buy Ethan Allan furniture, thinking I'd always love it....well not so much anymore.....I did sell some for penny's on the dollar and we did move some to our cottage...but I will never pay that much again because then you feel like you can never get rid of it. But the flip side is....we did enjoy it for 35+ years. 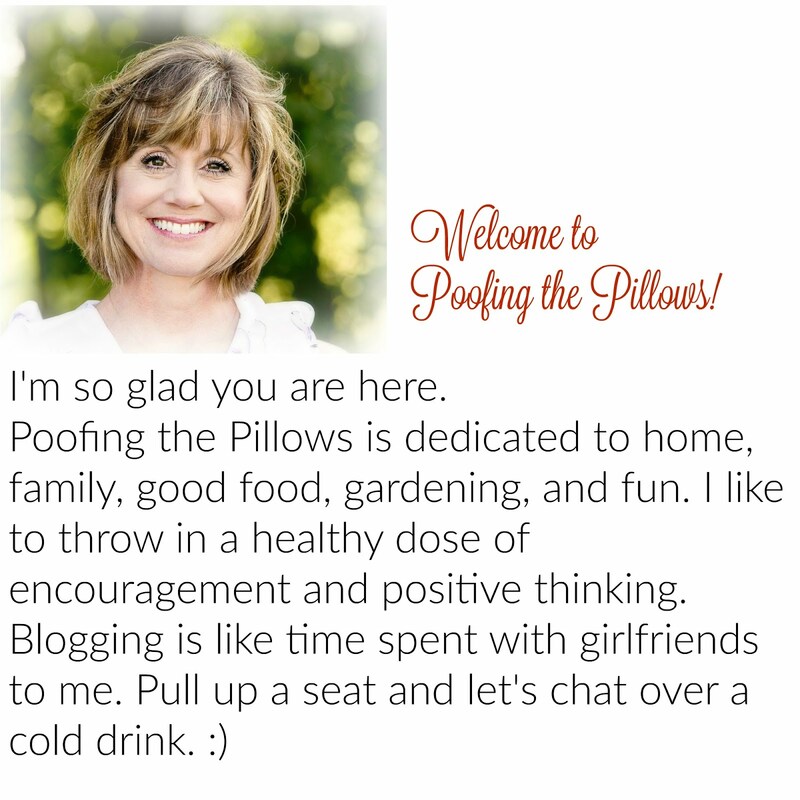 Thanks for your blog...I look forward to it. I love how you corralled some items on your silver tray. Even better that the tray is a treasured gift from a family member. Stacey, First I love every sweet little vignette! I really love your smart decor thoughts!